DEFCON 3: Purje pop-up on radar! I got to know Lauren Purje when I served as her pack mule, along with Rush Whitacre when we helped move Viridian Artists from its old space on West 25th St. to its current digs on 28th. Well, a lot of good that did. This wily one is heading back for a solo pop-up at EMOA Space, now presiding in our old suite at 25th,. Doh. It’s a week-long exhibit, and she told me she thought about doing an installation for it, yet it’s likely to be primarily a way to see what she’s up to with her new paintings. My two cents was: do an installation and show the paintings. We’ll see. In her paintings, she melds her own contemporary preoccupations into Romantic landscapes—she swoons for Turner—with an occasional skull seemingly manufactured offshore by Durer and then imported into Brooklyn via time machine from Renaissance Germany. In her unstable, ambiguous world, the comic Purje persona appears as a diminutive focal point, interrogating or just suffering her natural surroundings, which might contain a few badass stowaways on the time machine, such as a stray T Rex. Her humans enjoy about the same allowance of space, and influence, vis-a-vis the rest of the world, as they would in a Chinese scroll painting. She has somehow stirred a little Charles Schultz into a full shaker of Samuel Beckett for a cocktail to ease enchanted and amused brooding about subjects otherwise off-limits. Her heart sides with Schultz, not Beckett, as much as she would like you to believe otherwise. I was disappointed when she told me she doesn’t plan to exhibit any of her original drawings for the weekly comic she does at Hyperallergic. I tried to tempt her by saying I’d have shelled out some cash for the drawing she did where her persona was sleeping on the floor in a fleeting ray of sunshine through the window. No dice. That drawing had a cutline more or less as follows: “I don’t own a cat, but we have certain interests in common.” (She owns two cats now, hence a collectible!) It’s my favorite Purje, now lost forever she claims. (Bet not.) Her drawings are a subtle form of self-exposure, a la Jeffrey Brown—who once sent her a hand-written note which, when she found it in her clutch of U.S. Postal Service junk mail that day, caused her to bounce around her apartment as if it were a mosh pit. 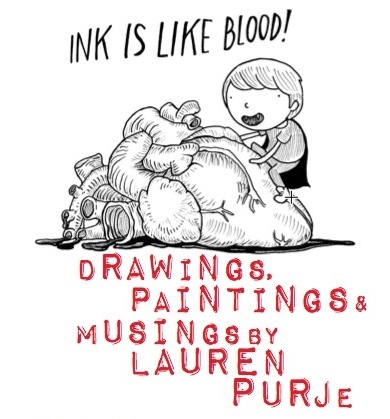 Her comics convey a refreshingly self-deprecating skepticism about her own inclinations while gently skewering the art world in general. In other words, she may be hard to pin down on the actual facts of her life if you ask her a direct question, but she’s unwaveringly honest and candid when she starts drawing her alter ego’s little bubble head. She’s a walking example of Fitzgerald’s maxim: “The test of a first-rate intelligence is the ability to hold two opposing ideas in mind at the same time and still retain the ability to function.” She’s constantly falling in love with her own life as the artist, and yet, at the same time, recognizing how much of the art world, like every other part of the world, is built on all kinds of unsavory fashions and elitisms. So she casts a cool eye on herself as she makes all the right moves for getting deeper and deeper into the New York scene. In her own life, I’ve watched her shrewdly connecting with influential art types, in remarkable ways, while simultaneously standing back and watching herself with the perspective of a pedestrian clocking a minor fender bender. She loves what she does. She hates what she does. Note the Transylvanian cape in the drawing above. Oh, Godot. It’s that “first-rate intelligence” that shapes her comics. She may be a moving target in actual life for anyone who tries to get a fix on her—but in her drawings she has an unerring bead on her own ink-pumping heart. Tags: Brooklyn, Charles Schultz, comics, E, EMOA, Godot, Hyperallergic, Lauren Purje, postmodern art, Rush Whitacre, Samuel Beckett, Viridian Artists.